Located in Grants Pass, Best Western Grants Pass Inn is within a 5-minute drive of Rogue River and Riverside Park. Featured amenities include a business center, dry cleaning/laundry services, and a 24-hour front desk. Free self parking is available onsite. 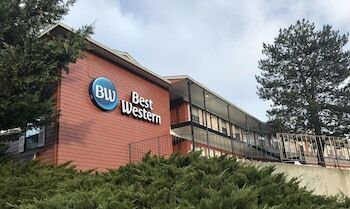 Located in Grants Pass, Bestway Inn is within a 5-minute drive of Barnstormers Theater and Grants Pass Welcome Center. Free self parking is available onsite. With a stay at Knight's Inn Motel in Grants Pass, you'll be within a 5-minute walk of Grants Pass Welcome Center and Grants Pass Museum of Art. Free self parking is available onsite. With a stay at Sunset Inn in Grants Pass, you'll be within a 15-minute walk of Barnstormers Theater and Grants Pass and Josephine County Chamber of Commerce. Free self parking is available onsite. With a stay at Discovery Inn in Grants Pass, you'll be within a 10-minute walk of Rogue River and Schmidt House Museum. Free self parking is available onsite.